Solidus Integration provides data acquisition, process control, and system integration solutions for manufacturing and R&D applications. We develop a broad spectrum of systems: from portable to room-size to distributed, from high-volume low-cost to one-of-a-kind, from data acquisition software to complete turnkey instrumentation. We provide contractual services in software engineering using National Instruments and MathWorks software development environments. We also provide programming and configuration services for embedded PCs (Windows Embedded Standard 7, Windows 10 IoT Enterprise), programming for embedded microcontrollers, digital and low-noise analog circuit design, as well as optical and mechanical design. 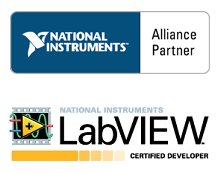 Solidus Integration is a National Instruments Alliance Partner since 1997 and a member of IEEE Consultants’ Network (Boston Section) since 1999. Our staff includes a Certified LabVIEW Developer, first certified in 2005. We are a two-times winner of the National Instruments “Best Application Contest” (semiconductor category). Over 20+ years, we have delivered more than 500 projects for close to 100 clients. Principal members of our team hold double master’s degrees in applied physics and electrical engineering. Each has more than 20 years of experience in high-tech. Altogether, they have authored and co-authored 11 papers in technical journals and hold 18 patents.